The mainland's only connection with Eel Pie Island (left). Photo by James FitzGerald. 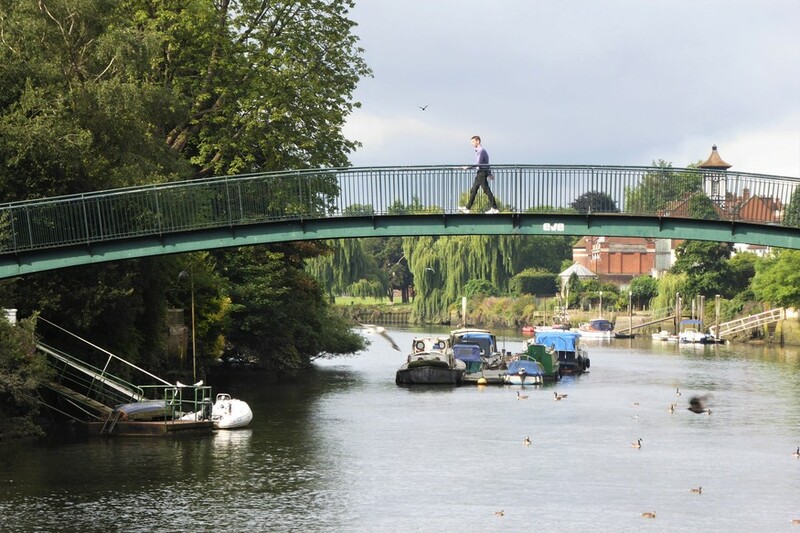 It's hard to find anywhere in London which packs in as much intrigue per square metre as one little ait sitting in the middle of the Thames near Twickenham. 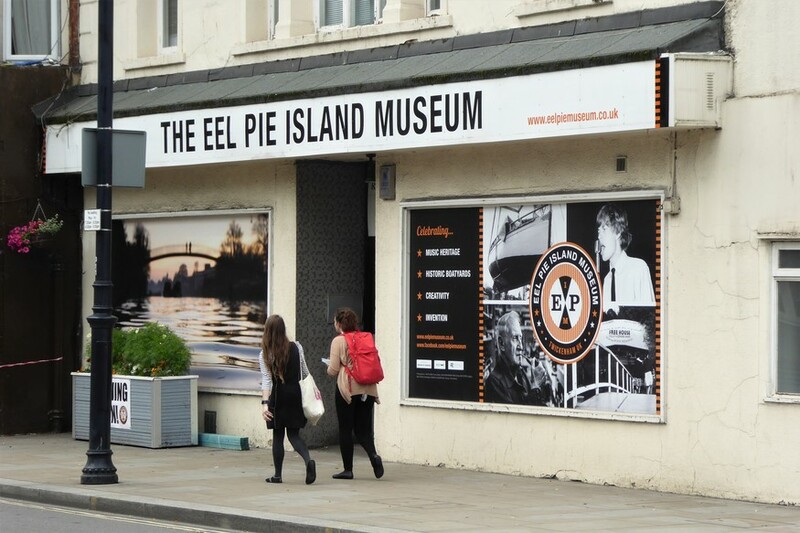 Its name is Eel Pie Island. The opening of a new museum proves that this miniature world, barely 500 metres long, is somewhere of great personal connection for many people — especially for anyone who remembers the '60s. Yet, for others, the island's legendary quality — and its current ‘private’ status — may give it something of an enigmatic, even exclusive air. Who would we find here? 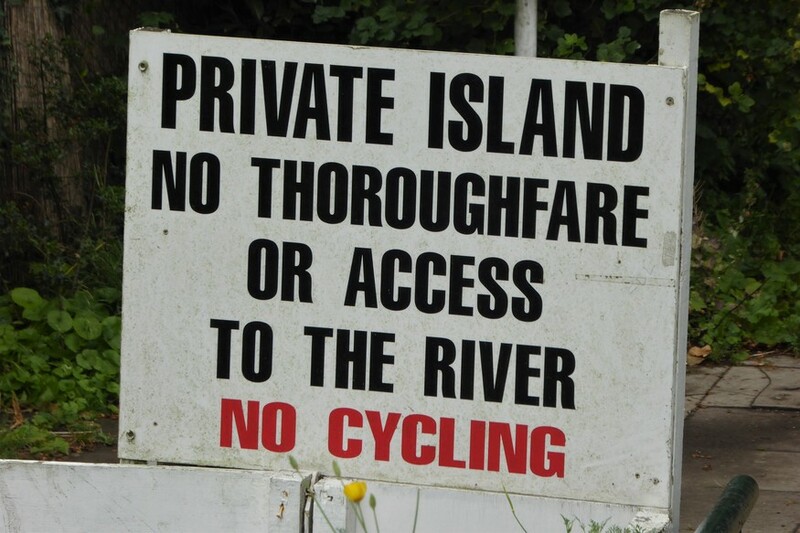 The island has an elusive quality for some. Photo by James FitzGerald. 'Anything at all. Even eels.' Photo by James FitzGerald. Eel Pie Island supposedly got its name from the famous pastries sold here in a distant past when that particular fish was so plentiful in the surrounding waters. For centuries, the island — accessible only by a ferry — was a retreat for those craving quiet, or privacy. It’s said that wealthy gentlemen would pay the boatmen not to row their wives over here while they canoodled with their mistresses. Later, a popular holiday resort would transform it into a site of immense noise and frenzy. 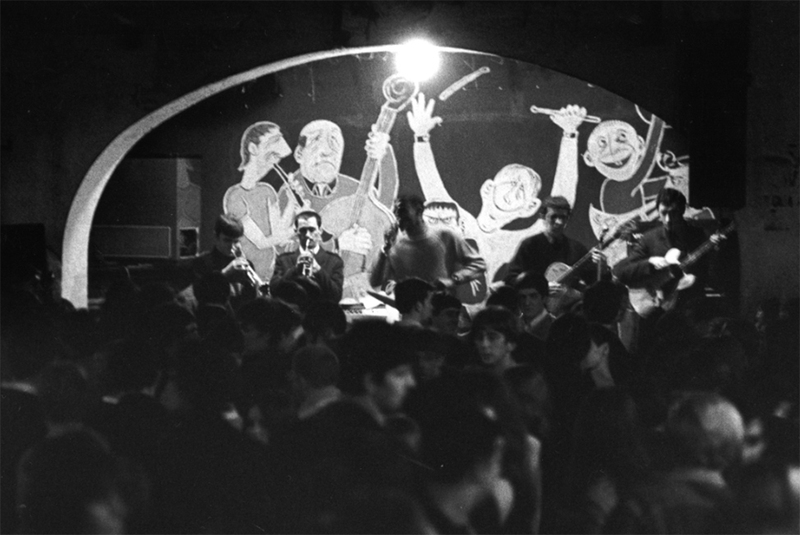 The island's nineteenth-century hotel — the haunt of Dickens and others — housed ballroom dancing, and then jazz performers, and finally, in the ‘60s, some of Britain's biggest-ever rock bands. The Rolling Stones, The Who, David Bowie, The Kinks, Pink Floyd: they all came to play raucous shows here. The island's old hotel. Photo courtesy of Eel Pie Island Museum. That stage of the hotel's (in)famous music club. 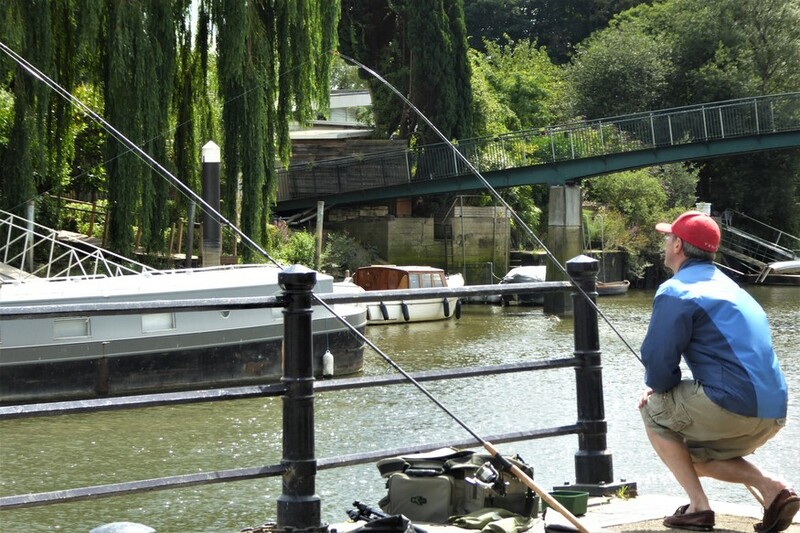 Photo courtesy of Eel Pie Island Museum. Revellers were issued ‘passports’ when they made the pilgrimage over. This unlikely musical mecca is fondly recalled by one Annie Nightingale: Radio 1's first — and longest-serving — female presenter. She grew up nearby. “I was actually banned from going to the island by my parents,” she tells us. Nightingale was reliant on being rowed over there by a friend. This was the whole ‘60s counter-culture developing. Right here in Twickenham. I regarded it as very boring suburbia otherwise. Radio 1's Annie Nightingale in the Twickenham area in the 1960s. Photo courtesy of Annie Nightingale. The hotel is long gone, burned down after falling into disrepair, but its attitude lives on in the characters who live and work here. The first person we call on is a man who managed to reignite a little of the island’s infamy. Harrison is not only the father of Mystery Jets frontman Blaine, but is also an associate member of the band himself, having played pretty much every instrument imaginable for them across several different stints. Today, though, all he’s playing for the band is the role of airport-chauffeur. A room still used by the Jets for laying down demos. Photo by James FitzGerald. 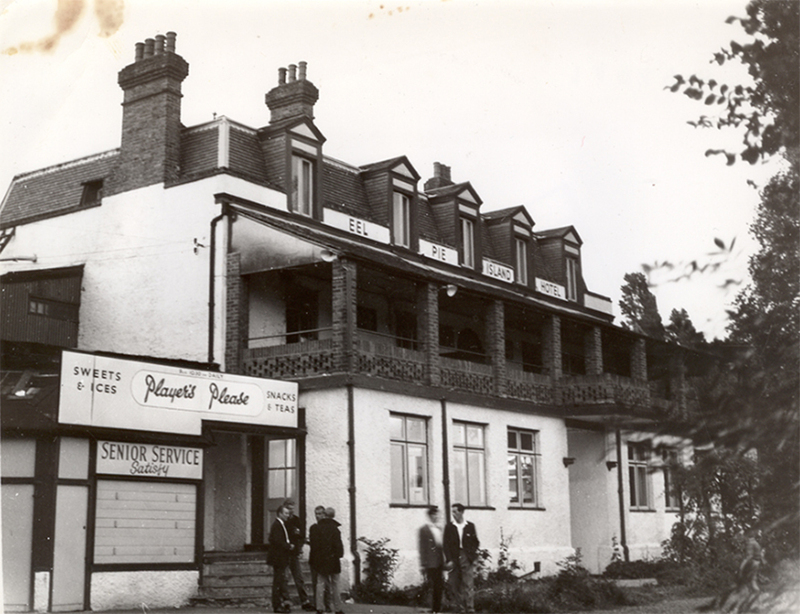 The band formed here, and still call Eel Pie Island home. That’s where the cramped old rehearsal shed used to be; there, the laundry-drying-room that the guys still lay down demos in sometimes. The pioneers of the so-called ‘Thamesbeat’ genre took inspiration from the island’s heady ‘60s. And that found an outlet in several notorious music-fuelled parties held here in the band’s early days. “Those were a self-conscious attempt to create here in south-west London a counter-scene to what the Libertines were doing in east London,” Harrison explains. At the fifth and final of the illicit shindigs — advertised on Radio 1 and attended by a crowd of some 700 people — two punters plunged into the slipway of the former boatyard that comprised his makeshift venue. Sometime Mystery Jet Henry Harrison with a former slipway that had a starring role in one music-fuelled party. Photo by James FitzGerald. 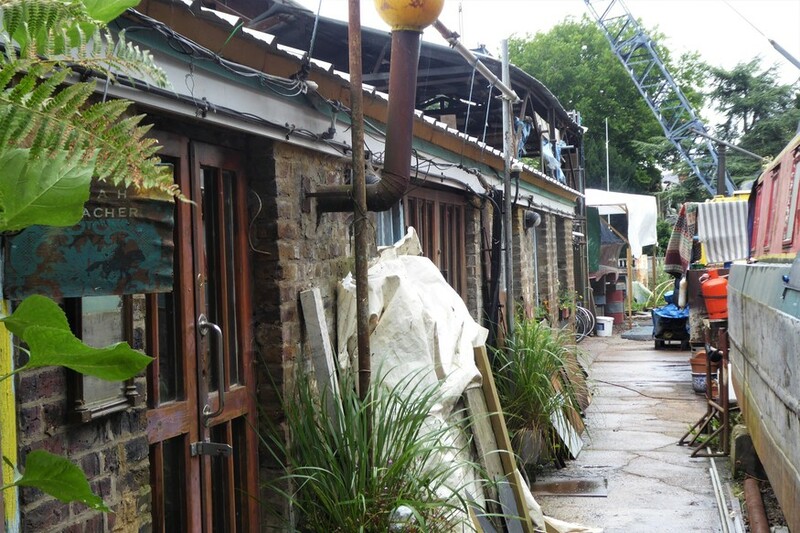 The artists' workshops on Eel Pie Island. Photo by James FitzGerald. The working quarters abound in knowingly wacky detailing. Photo by James FitzGerald. The recent timeline of Eel Pie Island seems to be structured around hugely destructive (but fortunately non-deadly) fires which serve to change its social ecosystem now and then. There was that big blaze in 1971 that finished off the dilapidated old hotel, and with it any remnant of the swinging sixties. Later, on Bonfire Night 1996, another conflagration raged here. Soon after the embers had cooled, the island’s present artist community sprung up. Their workshops skirt the island’s boatyard, and consist of repurposed vessels and disused cabins; each coated with a patina of rust, plant-life, and knowingly wacky detailing. The artists open their doors to visitors twice a year: in June, and December. One of them is Lee Campbell. Artist Lee Campbell. Photo by James FitzGerald. “I just needed a studio somewhere.” Words you might expect of a painter who’s compromised on an insalubrious location between a dual carriageway and a carpet warehouse for the sake of cheap rent — but not from one who specialises in depicting semi-rural settings and water scenes and has found a location truly surrounded by, er, semi-rural views and water. But Campbell insists that she really did end up here by chance. That it was great how this nice little room became available, but that the island’s rich creative history was kind of coincidental. 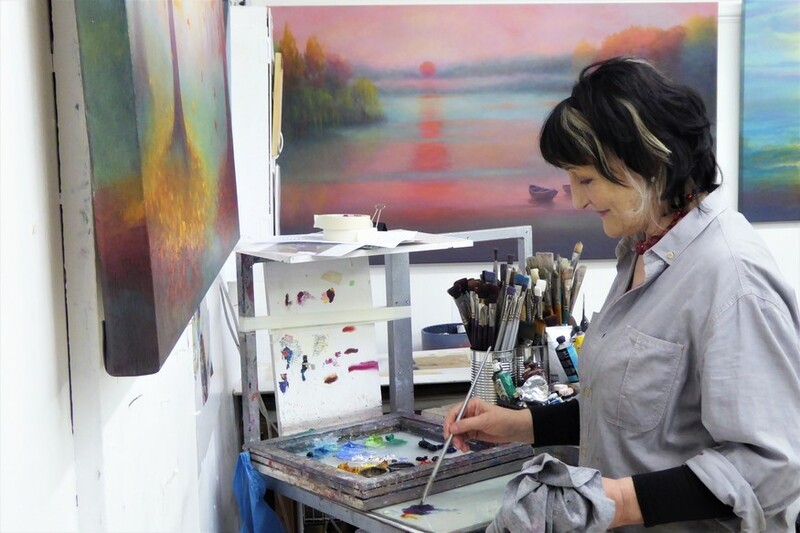 That her beautiful oil landscapes and seascapes, her mood paintings, and her intriguing close-ups of corroded materials, could just as easily be done on the mainland and maybe they will one day. While Campbell would seem to prove the adage that no person is an island, is the separation here from the mainland a big draw for some? 'It's got five feet on the clock.' 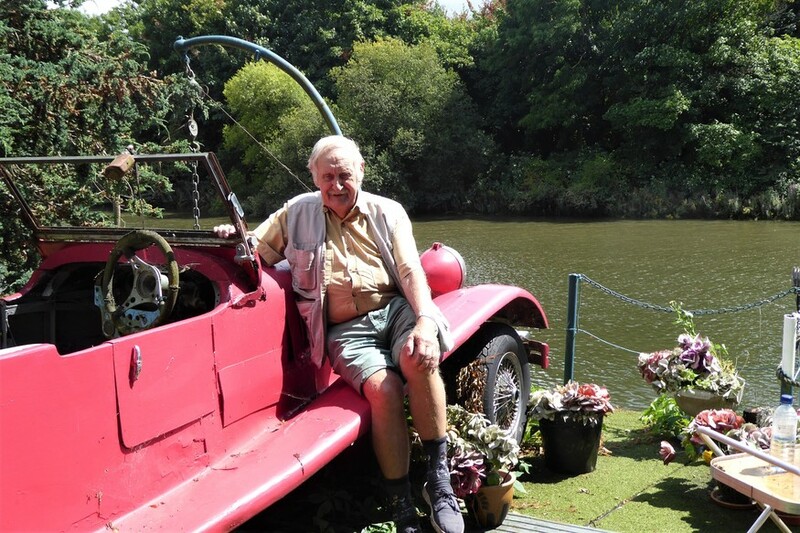 Inventor Trevor Baylis with the car he built himself. Photo by James FitzGerald. Trevor Baylis has been many things: a champion swimmer, a stuntman, and most famously, the inventor of the wind-up radio. He welcomes us to his home with warmth, and a volley of bawdy jokes. Baylis built the property himself in 1971. He fondly remembered “the girls” you could meet at the old music club on the island, and saved up to buy some land here during a profitable stint as an underwater escape artiste at a circus in Berlin. On the grand tour, we’re shown the famous workshop, as well as a home-built indoor swimming pool, living quarters, and, on one of two outdoor terraces that look out into the Thames, a car Baylis built himself that makes Chitty Chitty Bang Bang look no more unique than a VW Golf. “It’s got five feet on the clock,” Baylis jokes. There are no roads on the island. 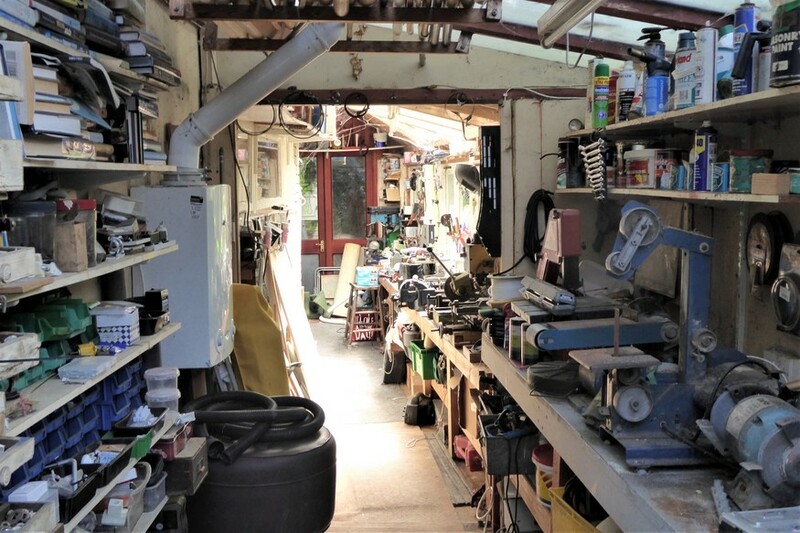 Baylis's (in)famous workshop. Photo by James FitzGerald. Within the grotto of spare parts, power tools, and Meccano that constitutes Baylis’s workshop, we’re shown the prototype of a product that has saved innumerable lives. The wind-up radio was built, right here, in the 1990s. It was designed to give customers in African countries a cheap, mains-electricity-free method of quickly getting news about the spread of AIDS. Baylis is keen to distance himself from the cliché of an eccentric inventor who hides himself away from the world. 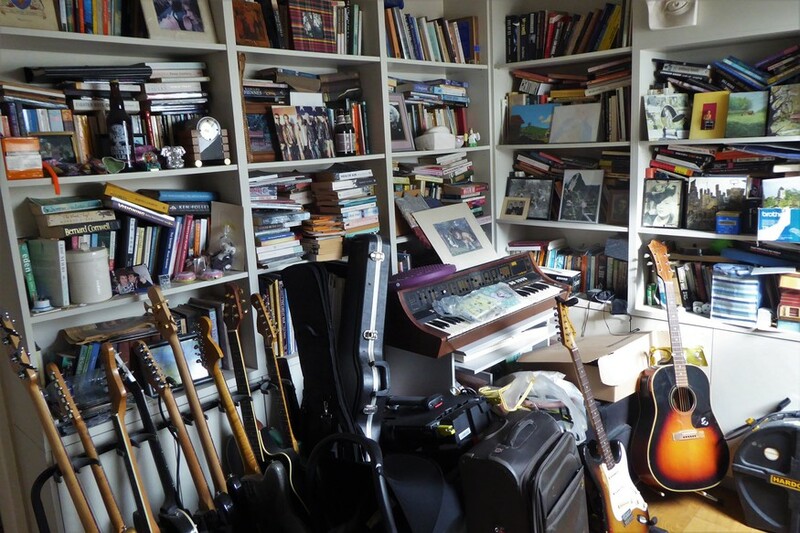 At the same time, he doesn’t deny that his unique mind has reached so much potential in this peaceful (if cluttered) sanctuary of his. And he’s one of those living here who’s about to see his legacy documented in a very real way, thanks to the efforts of another islander. The soon-to-be-opened museum at 1-3 Richmond Road, Twickenham. Photo by James FitzGerald. 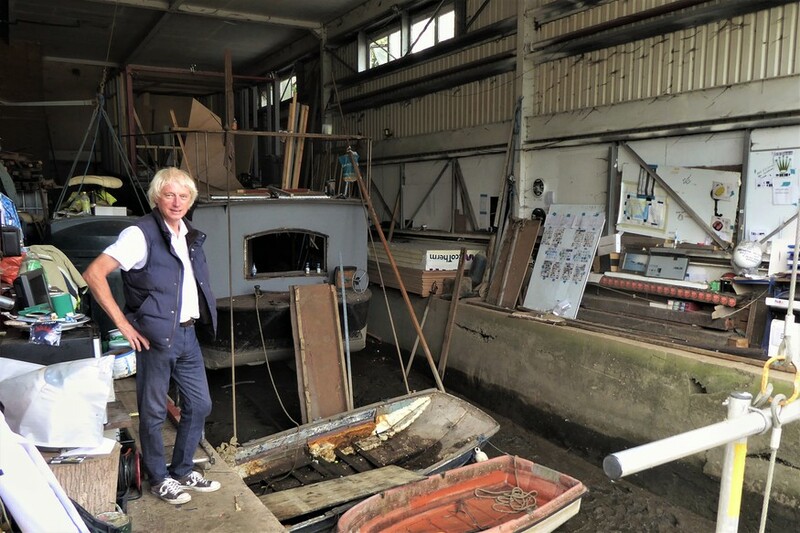 The Eel Pie Island Museum is being set up to record the artistic, inventive, social, and even boatbuilding legacy of this place. 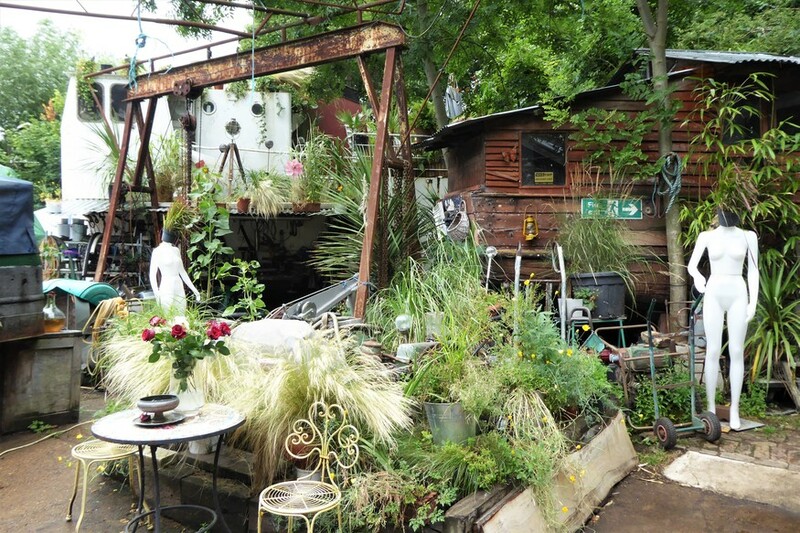 It’s just over the water in Twickenham, and has been spearheaded by curator Michele Whitby, a resident of one of the island’s many houseboats. Moored just between the centuries-old Twickenham Rowing Club and the island’s nature reserve, what she has feels like London’s answer to the Riviera lifestyle. 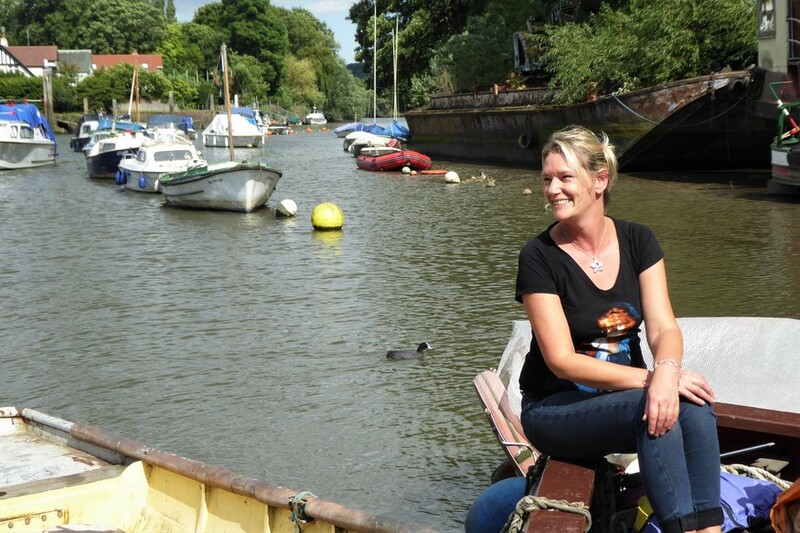 There’s an ever-growing fascination with Eel Pie Island, and it’s no surprise that Whitby sensed the demand for a museum all about it. Like many of the islanders, she also seems to have the patience of a saint with the many curious cameraphone-snappers who come wandering over here from the mainland (journalists included). 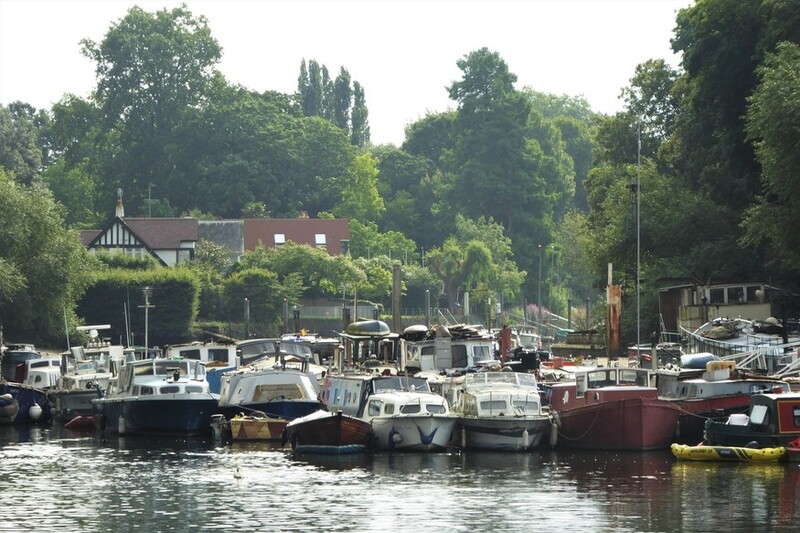 The population of Eel Pie Island comprises a number of people moored to it on houseboats. Photo by James FitzGerald. Michele Whitby, curator of the new museum. Photo by James FitzGerald. There couldn’t be a more enthusiastic ambassador for Eel Pie Island — or one who better embodies everything that’s varied and quirky about it. Whitby had a leather-working shop here, has written a book about the island, and now does part-time merchandising for the Mystery Jets next door. “And that’s what I love about it here,” she says. “We all know each other. Yes, we’re all a bit different. There are people who are very wealthy, and not wealthy at all. But whoever they are, you can guarantee that every year you’re gonna end up getting drunk with them at some point. Ha!” If there’s one thing that refused to be burned down or redeveloped here, it’s that old bohemian spirit.